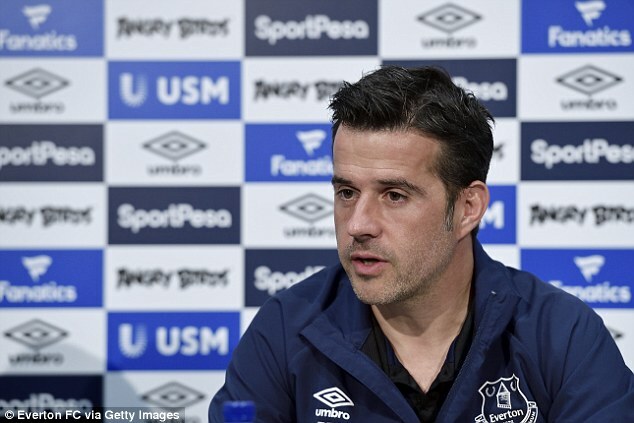 Marco Silva is ready to lay down a law where English is the language of Everton's dressing room as he vowed to improve his levels of communication. The Everton manager has spent the last 18 months working in the Premier League and now has a good command of English but during coaching meetings at Finch Farm, he reverts to Portuguese to converse with his assistant Joao Pedro and fitness coach Pedro Conceciao. There has been a significant change in the dressing room, too. It was not a conscious decision to recruit non-British players but there is a large Latin influence, headed by Richarlison – the Brazilian who sparkled when scoring two at Wolves last week – and the Colombian defender Yerry Mina. Silva is aware of how issues could develop if certain groups only wanted to stay in the company of those who talk their native language and, as a result, he has made it clear that he wants all the non-English speakers to sign up for lessons. Asked about conversing in English in the dressing room rules, Silva replied: 'Of course, and that applies to me as well because I am still improving my English. 'I am still learning it all the time. It's the same for everyone here. We talk about Richarlison but it is something I have already told Bernard and Mina to do. 'They have to learn English as well. Richarlison has to learn as much as English as he can and we are pushing him on that because it is important for him and for us. He is doing it but he needs to improve his English. 'In terms of settling, he is a fantastic professional and a good boy. Everybody likes him and he is enjoying the environment here as well. He performed very well last week but we have to be calm with him. Big changes have been made to the squad since Silva arrived on June 1, with six players arriving and eight players leaving. There could be more departures before the window closes for Championship loans and in Europe, too, with Mohamed Besic and Yannick Bolasie available. Such a big influx means the camaraderie at the club is not how it used to be in recent years – it couldn't be given the way the personnel has altered – but Silva intends to rectify that is a planning an off-field event to help the bond between the group. It is something we will do for sure, maybe next week because we have time next week,' said Silva, whose side face Southampton today. 'It is important we get together as a group and not only for one lunch or one dinner. We can do something here at Finch Farm perhaps. 'It is important because there are a lot of new faces in the group and the competition has started now so we can't go abroad at the moment.